Good news for the Latvian 2-spyware readers! As the extensive globalization continues to unify the world, most security blogs and infosec sites turn to the English content only. However, the attempts to please the English-speaking audience often turn against the speakers of other tongues, who prefer reading the content in their native language. Having this issue in mind, eSolutions team has taken another step towards making 2-spyware more user-friendly. We are proud to introduce Latvian site as the newest member of 2-spyware project family. Viruss.lv was released at the end of July and continues to grow rapidly. Though the site is still freshly baked, it already contains all the crucial information about the most vicious viruses known today. What is more, every virus description conveniently features removal recommendations and suggestions on how to avoid malware infections in the future. 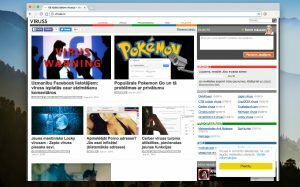 We should point out that all the information provided on the Viruss.lv is approved by the professionals who seek to introduce the readers with the latest and most accurate cyber security news. The Viruss team of experts is always ready to answer general security related questions or give additional suggestions to help the users solve virus elimination problems. We believe that addressing the audience in the language it understands best is the key to delivering the intended message comprehensively and helps to spread the cyber security awareness better.